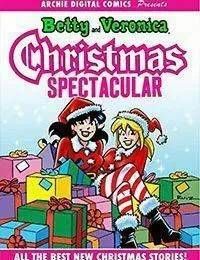 Join Betty and Veronica for the jolliest ALL-NEW Christmas stories of the year! Veronicas got quite a collection of cards no, not Christmas cards, credit cards! But who knew they could provide more than just a form of payment? Find out the other use of credit in Its in the Cards. Then, Santa is reviewing his gift list and his elves are working overtime to supply him with spreadsheets regarding the behavior of kids of all ages. But somethings weird in one of his Riverdale spreadsheets: Betty Cooper naughty? Veronica Lodge nice?? Santas puzzled usually its the other way around! St. Nick decides to go undercover to learn what is behind the Betty and Veronica turn-around in the best possible disguise as a shopping mall Santa! Find out what caused this merry mix-up in Naughty or Nice? Unwrap these stories and MORE in this collection of ALL-NEW holiday fun!